The Pensacola Ice Flyers have been getting lots of coverage on two of my favorite web sites; Icethetics and PuckDrawn for their new logo - which is getting lots of jeers from those two sites. But is seems there is even more exciting news coming from the SPHL, at least more exciting for me... The Southern Professional Hockey League (SPHL) announced that it will drop the puck on its sixth season on Thursday, October 22. The 2009-2010 season features three new expansion teams, one of which is a old favorite of mine, the Louisiana IceGators. 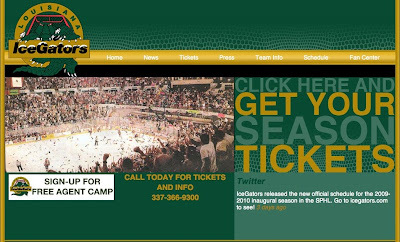 The Ice Gators originally played 10 years (1995-2005) in the ECHL until they had problems renewing their conract with the arena they were playing in. I was lucky enough to have a friend named Todd in Louisiana who used to send me all kinds of cool IceGators stuff including their weekly TV show Chomp Time. It's great to see the IceGators will be back in action next season! You wouldn't still happen to have those videos would you? I've been looking everywhere! Yes, I still have a bunch of "Chomp Time" episodes recorded on VHS tapes. How Many NHL Teams can you name? The Quad City Mallards are Returning!